Do you know the way to Santa Fe? Jenna Annable (far left) joins her UND Frozen Force teammates Emma Kischel, Dana Atkins and Dakotah Osborn as they start out today in the 2017 all-female Air Race Classic, a 2,600-mile, three-day aviation derby from Maryland to New Mexico. Photo by Shawna Schill. FREDERICK, Md. —Don’t be surprised if UND student pilot Jenna Annable is a bit giddy today. She’s excited to be home in the Washington D.C. area, near her native Northern Virginia, with friends and family. But at the same time, she’s eager to take off and head west again as a member of UND’s “Frozen Force” flying team that’s competing in this year’s 2,600-mile Air Race Classic. More than 50 racing teams, including 16 from universities such as UND, are departing Frederick today in the most famous all-women’s air derby. Over three days, they’ll buzz through eight waypoints, including Bemidji, Minn., on the way to the finish line in Santa Fe, N.M.
It’s a thrilling prospect for Annable, a native of nearby Winchester, Va., who comes from a family of aviators. While home, she’s been playing the role of tour guide for her UND teammates and catching up with friends. “I’m able to say, look guys, ‘this is why I went to North Dakota… I’m actually a pilot, flying an airplane in a race across the country,’” she said. After considering other places, such as Purdue University and Embry-Riddle Aeronautical University, for Annabel, the journey from Northern Virginia to UND proved to be the right move — one that felt good from the beginning. “The moment I stepped on the UND campus, I just kept repeating ‘this was where I wanted to be,’” she said. More than 50 racing teams, including 16 from universities such as UND, are departing Frederick, Md., today in the most famous all-women’s air derby. Over three days, they’ll buzz through eight waypoints, including Bemidji, Minn., on the way to the finish line in Santa Fe, N.M. Graphic by Richard Larson. It’s Annable’s second year as a member of UND’s four-member Air Race Classic team. This year, she’ll be in the plane as the team navigator, after filling the role of ground-based coordinator, stationed back in Grand Forks, last year. 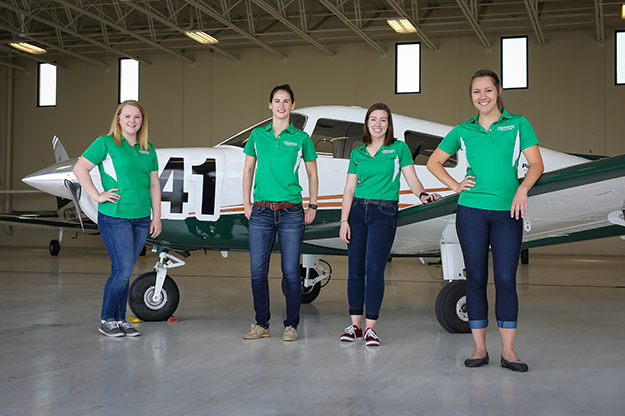 Annable joins UND teammates and race veterans Emma Kischel, Virginia, Minn., who will serve as this year’s pilot; and Dana Atkins, Sycamore, Ill., who moves to the co-pilot spot after piloting the race in 2016. This year’s ground-based coordinator is Dakotah Osborn, Newton, Iowa, who is a first-year team member. She actually will be performing her duties from Bowman, N.D., in southwestern North Dakota, where she is taking part in a summer internship, flying into thunderstorms and conducting research for a weather modification firm. 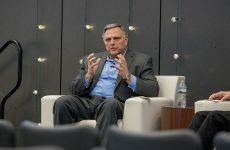 Osborn will stay busy as the UND team’s primary media contact for interviews and disseminating information to the public through various means, including social media. 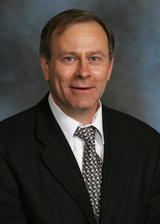 “The whole team aspect makes all of our jobs a lot easier,” Osborn said. The team’s coach is UND chief instructor Erin Roesler. Another crucial factor in the team’s success is the valuable weather information routinely fed to them from a group of UND atmospheric sciences students who are overseen by Associate Professor Fred Remer based back home at the John D. Odegard School of Aerospace Sciences. And the general feeling is that Remer’s expertise rubs off on this student weather watchers, who start each morning’s forecasting at 3 a.m. CST to have briefings ready by 6 a.m. on the East Coast. 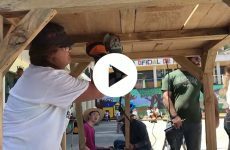 “The team is very dedicated,” Remer said. “Our weather team is made up of nine Atmospheric and Aviation students. We only have four forecasters returning from last year. Most of the students have never forecast for aviation and it gives them a new perspective on weather forecasting. 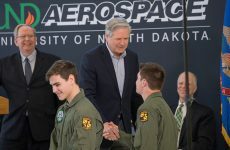 This is UND’s fifth year competing in the Air Race Classic, but the race itself dates back to 1929, when it was known as the “Powder Puff Derby” with connections to famed female aviators of the past, such as Amelia Earhart. 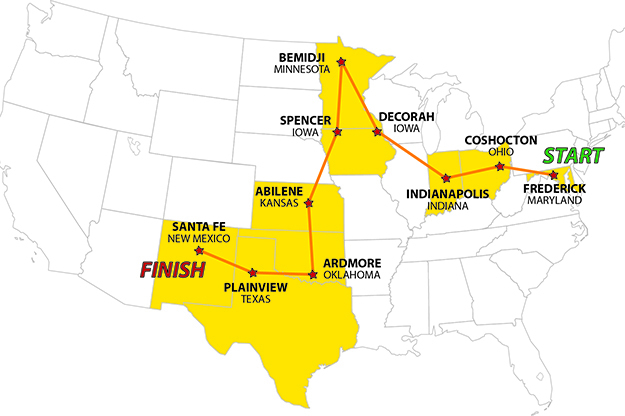 After departing Maryland, the first leg of the race ends in Ohio; and then on to Indianapolis; Decorah, Iowa; Bemidji; back down to Spencer, Iowa; Kansas; Oklahoma and Plainview, Texas; before finishing up in Santa Fe. UND’s top finish in the race came in 2015 when it took second overall. Last year, UND finished fourth overall, and third in the collegiate division. The top 10 finishers get a share of an $18,000 prize purse this year. The UND Team also has a crowdfunding effort going on to help defray the cost of the competition. The goal is to raise $2,650 ($1 per mile of the race). According to Atkins, UND will be flying a different aircraft compared to last year. UND recently converted much of its training fleet to Piper Archer single-engine aircraft, replacing many of the Cessna 172s that UND Aerospace has used. “It’s going to be a learning and growing year for us since we are flying a brand new aircraft,” she said. Because of the varied aircraft and wide-ranging power and capabilities of the airframes used by teams in the Air Race Classic, the order of finish isn’t determined by the fastest times from Point A to Point B. Instead, Atkins explains that each team is assigned a handicap airspeed, predetermined through a series of test flights and complex mathematical formulas. Teams are then ranked in accordance with how well they are able to maintain and improve upon their assigned handicap. Atkins said the Piper Archer airframes tend to be little faster than the Cessnas the team flew before. Still, wind and weather reports received from UND atmospheric sciences students will be key again this year. “A lot of our success is because they have given us such high quality weather briefings before each flight – they’re great,” Atkins said. UND Air Race Classic Teams are carefully coordinated and put together each year. UND female pilots must apply and be chosen for the squad based on piloting background and personality. In that regard, UND, so far, has passed with flying colors. Copyright © 2019 UND Today. All Rights Reserved.